Beautiful places I have seen and beautiful places I want to see with my own eyes. "...let's see colors that have never been seen, let's go to places no one else has been.."
Dolbadarn Castle, a photo by Spring.Break on Flickr. this photo was taken by me (Via my Flickr gallery). the Dolbadarn Castle was built during the 13th century by a welsh prince. you can find more information here and there. I arrived to Llanberis by myself, after my travel partner and I decided to split our ways. It wasn't my first time abroad and it wasn't my first time traveling by myself abroad. but it was still hard to get by over there...my english wasn't as good as it is now, plus the Welsh accent didn't make it easier on me. oh, and the way the welsh pronounce double L is like the english pronounce TH in the word thin. so Llanberis is pronounced /thun-be-rees/. I had lots of troubles with explaining to people where I wanted to go. anyway...I stayed in a youth hostel, where I met a japanese guy. can't remember his name. he was very nice and we went for a walk through town and we reached this castle by mistake. the most beautiful and unique places are found by mistake. that's my moto. so this japanese guy was really into photography. what a surprise, right? he taught me a thing or two about photography. one thing that I remember very good is that sometimes, when taking a photo of a landscape or something really dramatic, it's good to have people in the photo too. it's good for perspective, he said. I guess this photo shows this principle pretty good. Meteora Valley, a photo by Darby Sawchuk on Flickr. I came across this photo on Flickr and decided that I want to be there someday. Metéora in Greek means "middle of the sky" or "suspended in the air" (from Wikipedia). I love everything about this photo - great vivid colors, great composition - but I'm not here to talk about photography. I'm just an amature in this area. This place has everything that I look for in a travel destination - dramatic rock pillars, mountains in the background...By the look of the skies - not so hot and not so cold. An old building in the middle of nature (in this case - one of the six Eastern Orthodox monasteries). Colorful trees. looks magical and special. I found a photography and travel blog which I really like, called "Blame the Monkey". 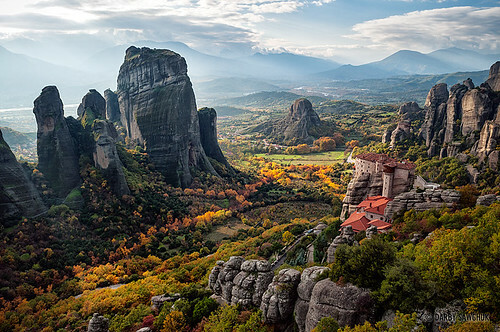 The photographer and writer, Elia Locardi, wrote a post about the Meteora. My name is Aviv. I'm a traveler. That's all you need to know.